Samsung now has lots of smartwatches to choose from, so here we're going to talk you through the whole line up. Samsung is one of the very best smartwatch makers on the planet competing against the greatest devices on the market including the Apple Watch 4 and Fitbit Versa. The company has been making smartwatches since 2013 when it introduced the square-faced and (by today&apos;s standard) woefully lacking Samsung Galaxy Gear. We&apos;ve seen various iterations of its wristwear over those last five years, and the company has since come into its own with its latest few wearables. 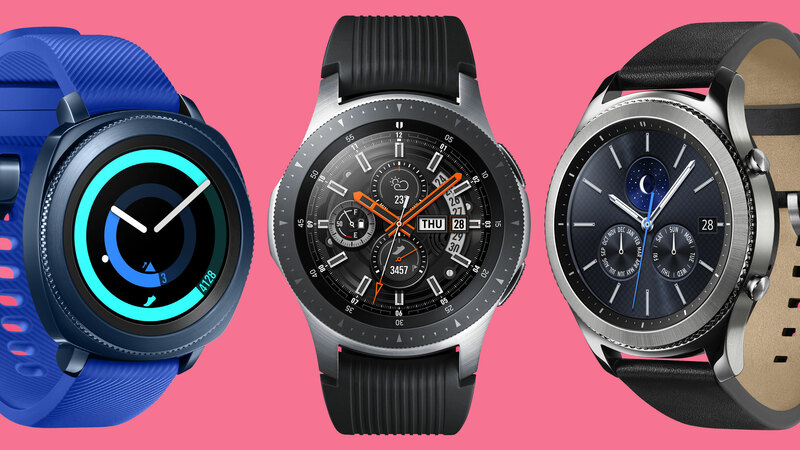 Below we&apos;re going to talk you through the very best Samsung smartwatches that you can buy right now, which includes the likes of the Samsung Galaxy Watch and the Gear series from a couple of years ago. We&apos;ll also mention the Samsung fitness trackers the company has created. Note that they&apos;re all ranked in terms of functionality, so we take into account what you can do with each watch, its design, the price and much more when curating this ranking. You should also note that we have yet to properly try the Samsung Galaxy Watch Active for our full review process, and the same goes for the new Galaxy Fit series of activity bands. We expect those wearables to feature in this list very soon. The very best Samsung smartwatch we&apos;ve tried is the Galaxy Watch. We&apos;ve yet to fully get our Samsung Galaxy Watch Active review underway, but that device is going to have a tough time competing with the full-featured Galaxy Watch. This is undeniably Samsung&apos;s most well-designed smartwatch. It comes in two variants, which are quite dramatically different. If you&apos;re looking for the largest watch, you&apos;ll want the 46mm version that comes with a bright 1.3-inch display. Then there&apos;s also the smaller (yet thicker) 42mm variant. Both watches feature a rotating bezel that allows you to easily navigate around all of the features the smartwatch offers. It&apos;s a feature you won&apos;t get on any other smartwatch at the moment, and it works so well on the Galaxy Watch that it&apos;s one of its biggest selling points. Both feature Samsung Pay, GPS, swim tracking and a lot more. This watch will work as both a fitness device as well as a premium looking timepiece. We&apos;ve tested the larger version of the watch more than the smaller one, and we&apos;ve found it lasted for around four days with average usage. If you&apos;re certain you want a watch that sports Tizen software, your best choice right now is the Galaxy Watch. On paper, the Samsung Gear Sport doesn&apos;t sound all that different to the Galaxy Watch but if you were to compare the two watches you&apos;ll notice a lot of differences. The company smoothed out a lot of the problems with the Gear Sport, but you may be fine with them considering how discounted the price of the Gear Sport now is. A lot of what you get on the newer generation is here alongside the latest in Tizen software, so you&apos;ve got access to all of the apps that you&apos;ll get on the Samsung Galaxy Watch. The screen on the watch is large and easy to navigate around. The watch can track your location when you&apos;re running, and you can upload music to your watch and listen to it through Bluetooth headphones; overall there&apos;s lots to love here. If there&apos;s a big downside, it&apos;s that the overall visual design isn&apos;t as slickly implemented. All of that said - it&apos;s still a good-looking watch that you may want to have on your wrist if you&apos;re after a high-spec device but you don&apos;t want to spend lots of money. The Gear S3 isn&apos;t far off the Gear Sport either, but the watch is a touch older making it a lot harder to recommend. If you can find the Gear S3 for a lot less than the Gear Sport it may be worth getting that instead, but in our searches around for price we&apos;ve struggled to find it for a suitable amount. Instead, you&apos;ll be better off buying either the Galaxy Watch or Gear Sport with a bit of extra money or checking out our full best cheap smartwatch guide for a look at the best wearables you can get right now. You may still be able to find the Samsung Gear S2 or even the original Gear, but we wouldn&apos;t recommend buying these in 2019. Instead, look to the watches at the top of this page as these older devices are unlikely to be updated in the future and may soon become obsolete. Unless you find an absolutely incredible deal, we think it&apos;s worthwhile spending extra on the above or considering a watch that doesn&apos;t run Tizen software. Samsung&apos;s Gear Fit 2 Pro is one of the best looking fitness trackers with an impactful, bright and clear 1.5-inch Super AMOLED screen that wraps around the device. There aren&apos;t many fitness trackers on the market that look this good. It&apos;s comfortable to wear when you&apos;re working out, and it comes with a couple of features that make it better than its older and cheaper sibling, the Gear Fit 2. Perhaps the most important is the fact you can have offline Spotify playback on the tracker. That allows you to sync playlists to your wristwear, connect up some Bluetooth headphones and head out without your phone when you&apos;re exercising. That&apos;s especially useful as the tracker itself comes with GPS built-in as well as all of the other fitness features you&apos;d expect like exercise tracking, and a heart rate monitor too. It&apos;s also slightly more durable than the Gear Fit 2 with military grade protection that should make it even more likely to survive what you put it through. That exact protection is MIL-STD-810G, and it may be a reason you want it more. The exact upgrades of the Pro aren&apos;t as exciting as some would have hoped, but considering the price is similar between these two devices we&apos;d recommend going for the newer and more accomplished tracker. This is much more of what we&apos;ve said above, but it&apos;s just missing a couple of those extra features and comes for a little bit less. It&apos;s older too, so it may be Samsung gives up with updating the software for the Gear Fit 2 quicker than it will for the Pro. That said, we don&apos;t know for certain that&apos;ll be the case yet. Overall, if you don&apos;t want Spotify playback or a more durable design you may find the Gear Fit 2 is a better option for your next fitness tracker. That&apos;s especially the case if you find it for the right price, but quite often we&apos;ve weirdly found the Gear Fit 2 Pro is now cheaper than Samsung&apos;s newer tracker.